Rapid urbanization occurs in developing countries like the Philippines as people from the countryside move to large cities like Manila with the hope of finding jobs that will provide them with an income that can lift the economic status of their families in their home provinces. However, once they migrate to Manila, which has one of the largest population densities on earth, they soon discover that it is difficult to find a place to live. With little or no income in hand or relatives that they can impose on, many are drawn to the only housing that they can afford. Often they end up in one of the many squatter villages that populate metro Manila. Thrown together with cheap construction materials and little sanitation, these little villages spring up wherever their is undeveloped, abandoned or government property. Most end up being located in undesirable and dangerous locations that are subject to floods, earthquakes, fire or crime. Metro Manila’s newest residents send most of the money they make in their new jobs home to their families in the provinces. With the little left-over money that they keep for themselves as drivers, maids, vegetable sellers, laborers, etc., they soon find that it is difficult to raise their economic status enough to move out of the squatter villages. They soon become long-term residents building tight-knit communities with their new neighbors. Over the past several years, the Philippine government has been trying to relocate some of the residents that live along the most dangerous waterways that become flooded during the rainy season. Many deaths each year during typhoon season can be attributed to informal settlements that line the city’s waterways. Today I wandered into one of my favorite neighborhoods near JP Rizal Avenue and discovered that after giving the residents several weeks notice, their former homes were burned to the ground and demolished to eliminate the safety risk. The residents were in the process of being relocated to government housing that was being built for them in Cavite nearly 50 kilometers away from Manila. 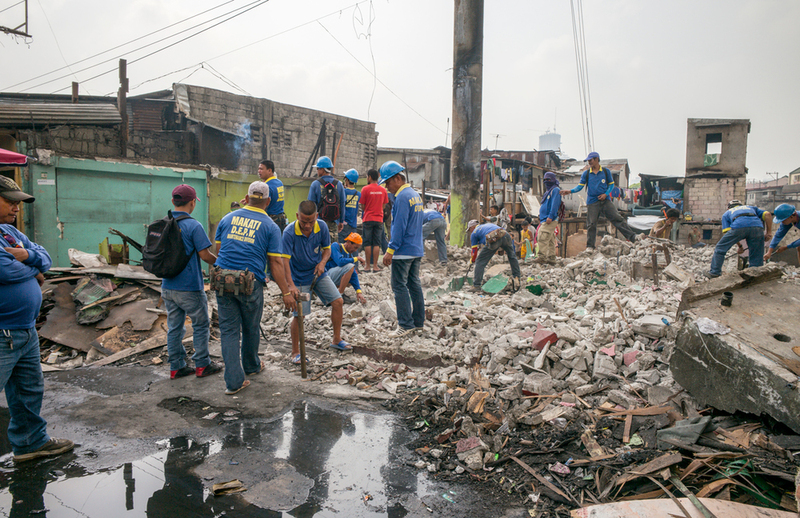 As some of the former residents scrounged through the rubble for things they might have forgotten, scrap material that could be resold or simply stared at what used to be their neighborhood, most communicated the sentiment that they would be back in Manila … most likely in another squatter village. With few jobs in Cavite, they voiced their need to be back in Manila as soon as possible to continue to earn the money necessary to support their families that depend on them in their home provinces.